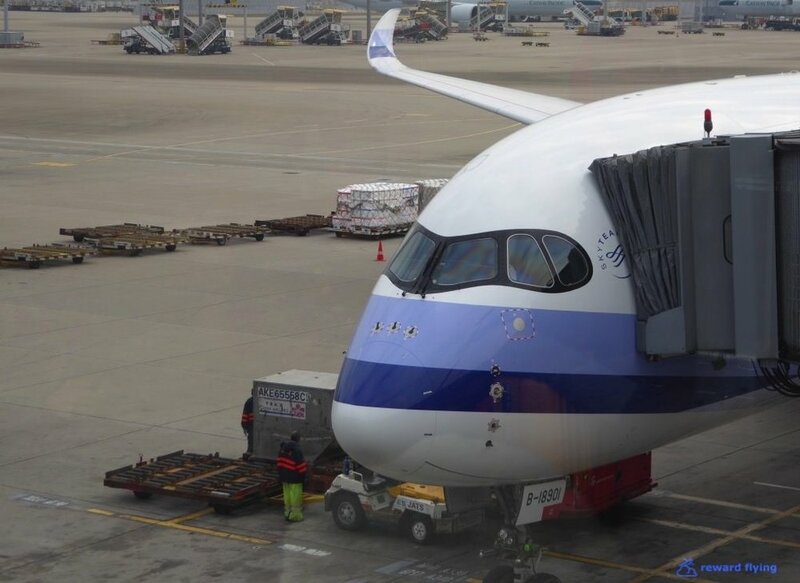 China Airlines has just taken delivery of their first few A350 aircraft and are flying training routes in Asia before deploying the aircraft on long haul routes. Recently China Airlines announced they will be flying their Airbus A350 aircraft on the Taipei - San Francisco route. While in Taiwan, when the opportunity to fly on this aircraft presented itself, I didn't hesitate. My only disappointment, if you can call it that, was I flew the 2 month old A350 instead of the 2 day old A350. Missed by a day! Poor me. Here is the 2 day old aircraft #903, waiting to go somewhere else. China Air also received their 4th A350 from Airbus on this day. These short flights are readily available using SkyMiles. I've also noticed, not doing a comprehensive search, that rewards on the A350 are available to the first few long haul destinations, Rome and Vienna. Delta wants 40K points for a one-way trip. Tip: Don't do it. Having experienced the morning chaos at Taipei's Taoyuan on prior travels, I made sure to give myself ample time to pass security and immigration. While not as busy as last time, the process still took 30 minutes. There is no fast track for premium class fliers at TPE. Once through I made my way to the China Airlines lounge. At 7:30AM with all the overnight passengers waiting for regional connections the place was packed. It's a comfortable lounge. While I didn't mind the dark dungeony feel to it, I can see where others might not. It is fairly good size without any natural light. Almost all seats are cushy couch like chairs. Only a few tables were offered for eating. These China Airlines travelers were a hungry lot as it was every man, woman and child for themselves at the buffett. Most of my photos are of empty trays. After a coffee I headed down to the gate strolling through the shopping mall, err, Airport. Sometimes I wonder about boarding agents. It's what they do, many times a day. Why is it that it seems they've never done it before? They had already loaded those that needed assistance, then they announced general boarding would be delayed. It didn't matter to me, but why? The China Airlines A350 cabin is stunning. Mood lighting. The red shade was a running light going back and forth through the cabin. Stock lavatory that wasn't particularly well supplied. The Sky Bistro is located at door 2 and was not offered on this flight. What it's supposed to look like when open for business. A look back at Premium Economy. Any ideas on what this means? 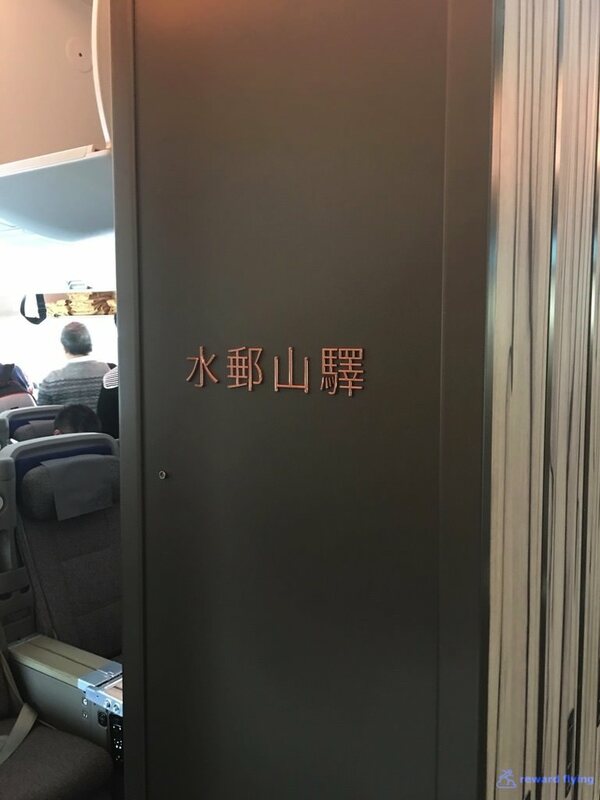 My translator shows "Water Post Hill Station"?? 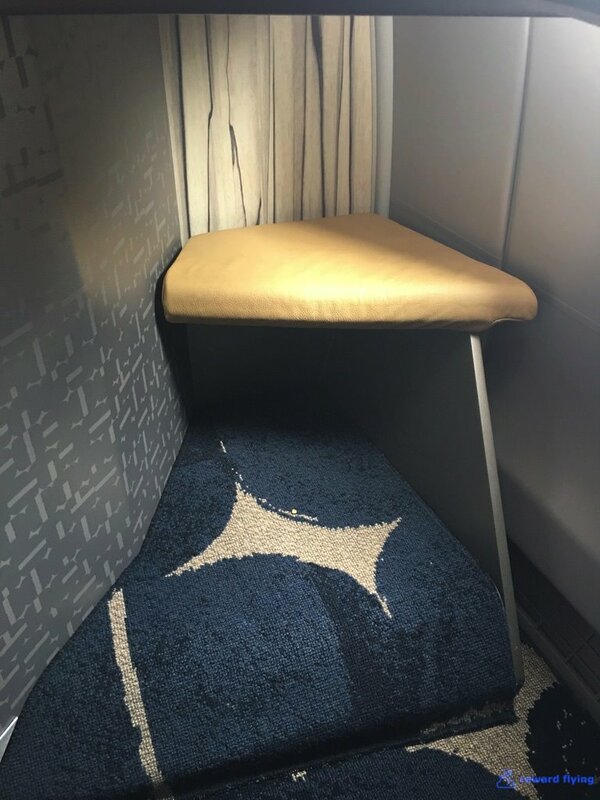 Having now tried all the most popular business class seats, for my tastes, the B/E Aerospace Super Diamond is the winner and China Airlines has installed them on their long haul aircraft. This makes CI an airline to consider when going long. 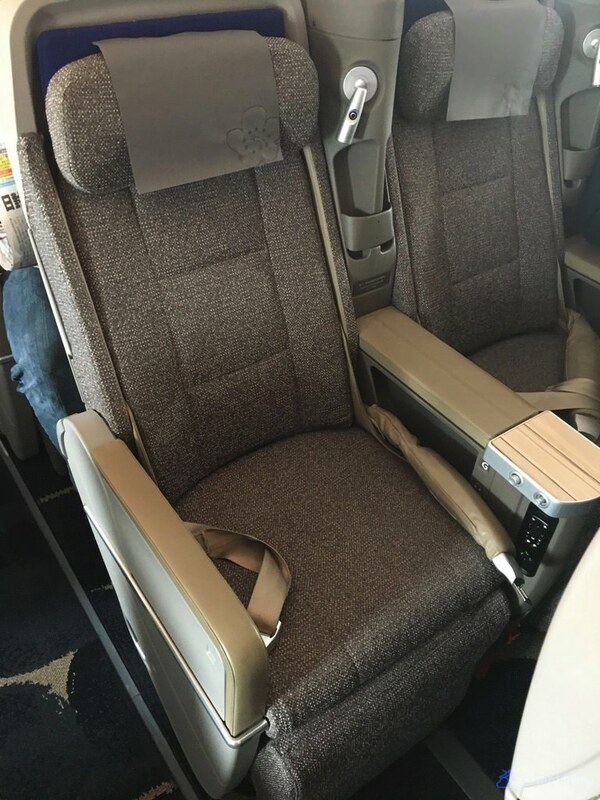 The China Airlines version of the seat seems similar to the stock version, unlike some others like Qatar who've done a number of upgrades. The lamp is an interesting, homey addition. The underside of the door cover is a large mirror, yet is still awkward to use. This little compartment at the base of the seat seems rather useless however. The aisle armrest can be lowered for more seat width and also doubles as a storage compartment for headphones or a bottle of water. Plenty of foot room for stretching out on this 90 minute flight. The two center seats do not have a retractable privacy divider. This is fine for couples but for solo travelers you want to get a window seat if you can. You can open the storage door for a partition, but you end up looking at yourself, or your food, in the mirror. Avoid seats D or G in row 10 unless you want to view the galley. You have no privacy in these seats at all. The window seats in row 10 are fine so disregard SeatGuru's yellow marking for these seats. Obviously this was not a sleeping flight but a nice ample pillow and soft comfortable blanket were provided. Cabin/Seats Rating: 8 out of 10 ✈ This could easily be a 9/10 if the bedding supplied for long haul flights is comfortable. Grab a paper on your way in. Be careful of the hottest Oshibori on record. Yes I was warned. I tried to get the steam on a photo, didn't work. Ok, so the beverage part is a little cluttered. But when is the last time you got a printed menu on an hour flight? For that matter, when did you get a full meal on an hour flight? I'm talking to you, USA fliers. Albeit lunch at breakfast time. Perfection can be elusive. For breakfast on this 9:10AM flight I chose the braised sea bass. But first I enjoyed some juice as it was too early for champagne for me, but was available. The mixed snacks didn't get opened based on the ingredients. 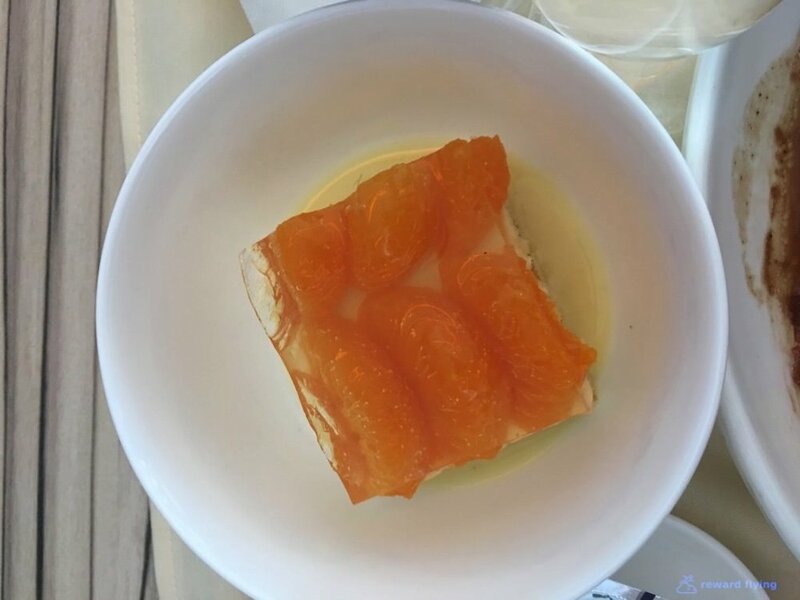 Okay, so points were deducted for presentation. But it was tasty. And the Milk Tea Mousse was just like mom used to make. Points have to be awarded for real salt and pepper shakers. Then on the way back I got to have lunch. This time I chose the chicken which I enjoyed. Getting a full meal on a 500 mile flight is pretty impressive. US domestic airlines should look to Asia for a tip or two on what premium class should be. The bad news first. I was in 10A and after the safety video my monitor went out. Denise, the wonderful cabin manager on this flight sat me in 10G so I could watch something. 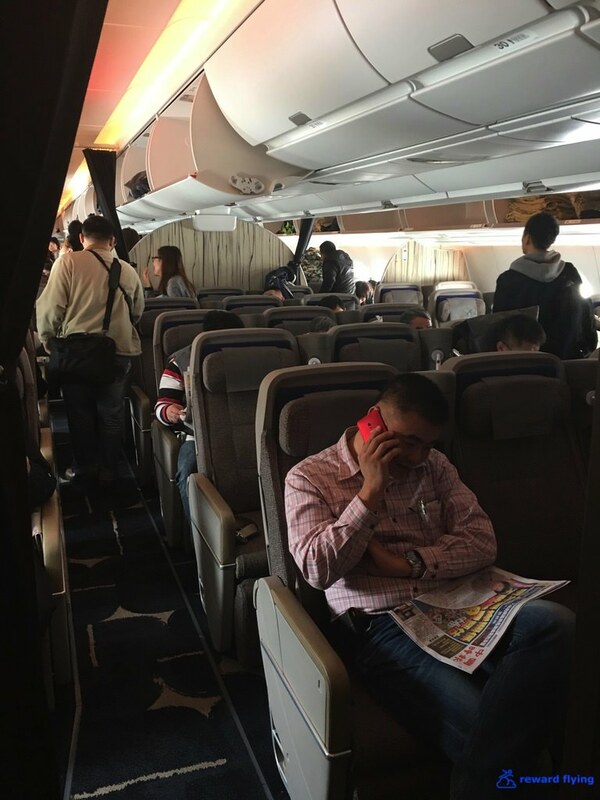 The next bad news is China Airlines did not get the outside cameras on their A350's (or they weren't showing them on this flight as well as not being on the IFE system as an option.) The video bug was understandable as new plane kinks need to be worked out. In fact, Airbus had a representative on this flight and he fixed the issue while on the ground in Hong Kong. 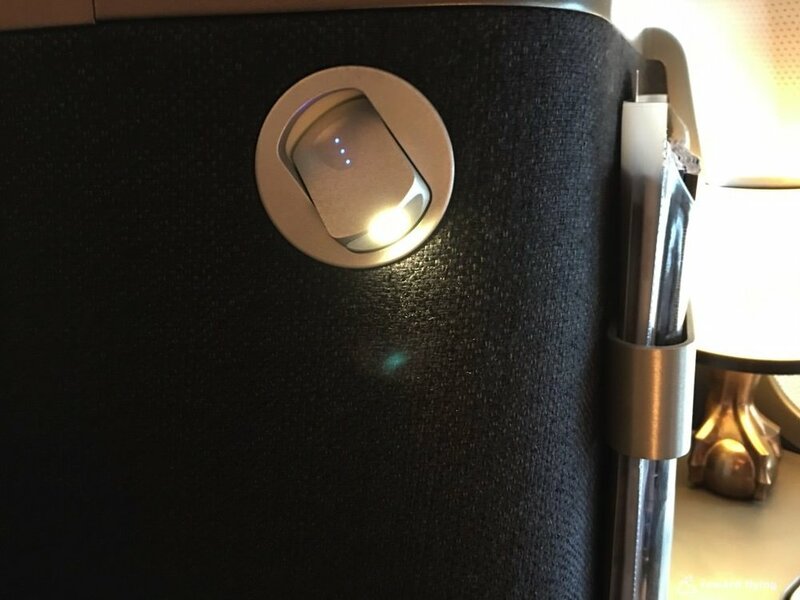 The high definition monitor could be clearly seen even with the window open. The crew was overly friendly, attentive and fun to be around. Denise introduced herself at the beginning of the flight and called me by name each time she spoke to me. Plus she was super excited to be working on this aircraft. Book a flight on an A350. Period. I would not hesitate to fly China Airlines in the future. Both Taiwanese carriers, China Airlines and EVA Air provide excellent premium transportation services. 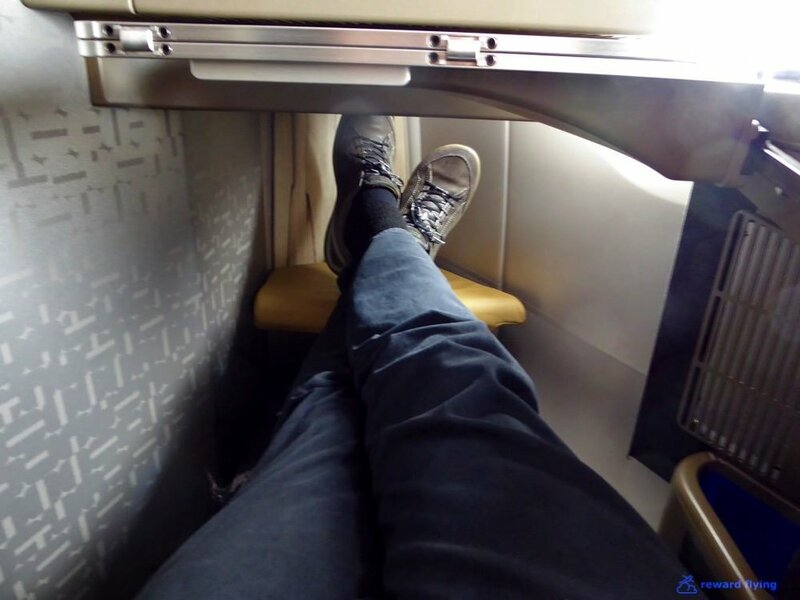 Do you have any China Airlines experiences you'd like to share? Feel free to leave a comment.